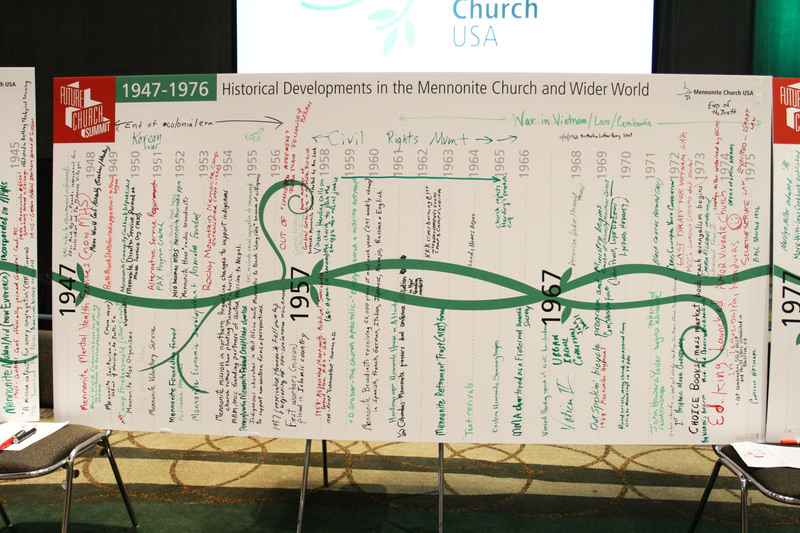 Ervin R. Stutzman, current executive director of Mennonite Church USA, also has historical inclinations. He has published a series of historical fiction novels, including the Return to Northkill series, looking at the encounters between the Hochstetler family and Native Americans, as well as From Nonresistance to Justice: The Transformation of Mennonite Church Peace Rhetoric 1908-2008, which is a rhetorical and historical look at how Mennonites articulate what they believe about peace. 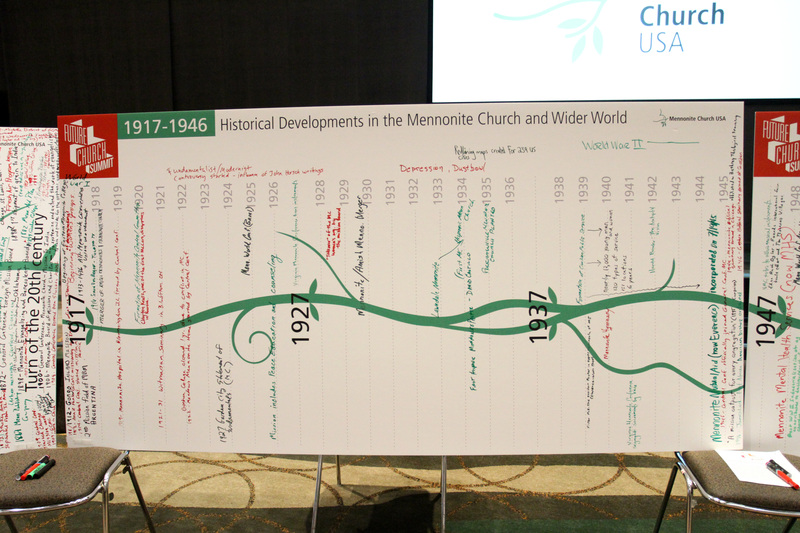 The power of history as a tool for understanding and controlling identity came to the forefront during Mennonite Church USA’s Future Church Summit (FCS), part of MC USA’s biennial convention. 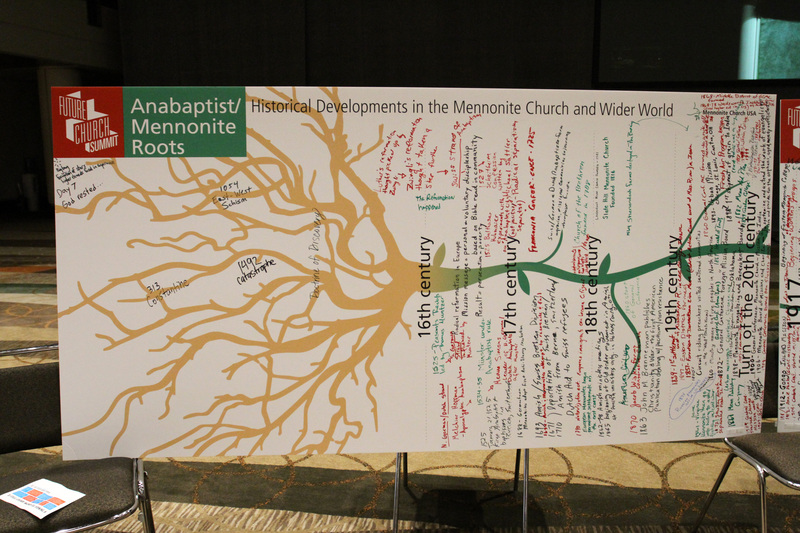 The FCS was billed as an opportunity for the denomination to imagine what it means to “follow Jesus as Anabaptists in the 21st century.” After building community with the table groups on the first day, the process turned to the question, “How our past has shaped us and what this may mean for us going forward?”9 To provide context, there was a plenary presentation that featured John D. Roth, Erica Littlewolf (Northern Cheyenne), Jason B. Kauffman, Bishop Leslie Francisco III, and Regina Shands Stoltzfus presenting a timeline of Mennonite history, graphically presented as a tangled vine growing from sixteenth century roots and stretching into the future. An effort was made to be as broad and inclusive as possible in the process. There was diversity represented among the presenters, with representation from African Americans and Native Americans, and participants were reassured that they would have the opportunity, indeed, were encouraged, to come up afterwards and expand the timeline. Some interesting dynamics were explored, especially as Erica Littlewolf teased out how Mennonite narratives of coming into the land and finding freedom and prosperity directly contradicted her people’s experience of suffering. There were problems in the presentation’s content, however, with significant gaps in the material presented. 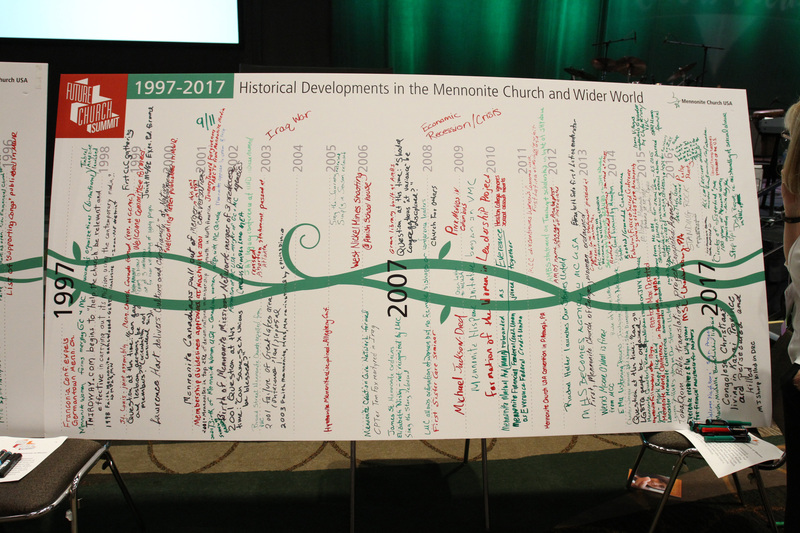 There was no mention of the rich Hispanic Mennonite tradition (though this was partly because a representative could not make it at the last moment), no past for the LGBTQ Mennonites (perhaps not surprising given the politics of MC USA), and no mention of the old General Conference Mennonites (an omission, I am told, that left some people so angry they could barely speak). The history as it was told did not contain all people present. This entry was posted in Essays and tagged Historiography, Mennocon, Power by JoelHNofziger. Bookmark the permalink. 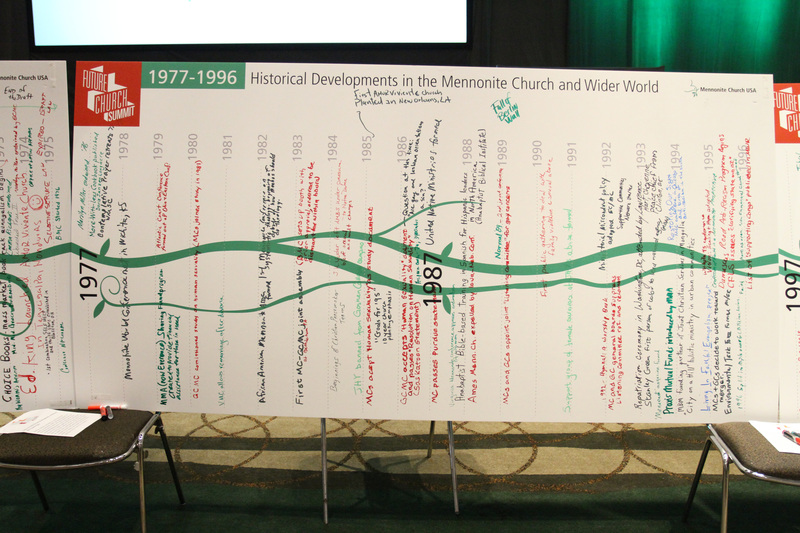 Joel, as a person not present in the room when this timeline was presented, I felt at a loss when someone approached me the next day and apologized for the absence of the Hispanic Mennonite history. I spoke to several of the Hispanic leaders over the next few days and discovered that they were not even aware that a timeline existed. Thus, when it was presented, and their history absent, they had no clue as to what was going on. They said they had seen the timeline in the exhibit hall, but did not know necessarily know what it was there for. For that matter, i saw it, too. One leader said he had been asked to go up to the front and give some kind of quick oral history of the Spanish Mennonite church, but decided he would not go up and rescue this situation since he felt it was not his place nor did he have the right information to give in front of so many people and misrepresent IMH or its history. I felt I had to push and kept asking these leader to write their own history, instead of waiting for someone else to write it for them. How do they write their own history and not wait for someone to come in and interview them and write their history from their own perspective? They questioned why IMH leadership had not been told that the person that was to represent them was not going to be present. If they had known, they could have been prepared. Keeping in mind, these leaders are pastors, delegates, leaders, and not historians. Throughout the summit, I heard a Hispanic leader say, “We are not invisible.” This led me to my own statement: “We’ve been working for over 50 years as Hispanic Mennonites. We’ve been working in our own contexts at our relationship with Jesus, our communities, and helping our neighbors.” We are not invisible, the work of the Lord is not invisible, the hand to reach a soul, feed the hungry, clothe the poor has always been visible. It may be that others don’t know because their history is one rich in oral tradition versus the written tradition. It might be that Hispanics are defining who they are as Anabaptists on a daily basis and what it means to follow Jesus in their own contexts. A timeline places a dot on a date and time that can be measured by a historian. I shared in a panel discussion with Anita Hooley Yoder that I, myself, was not aware of the significance and importance of the work my parents and other Spanish pastors were doing in South Texas as Spanish Mennonites when I was growing up. I was living it. It is now, later in life, that I look back and reflect on the value of what it all meant and why I stay in the Mennonite church to this day. I don’t stay because of tradition. I don’t stay because I don’t have other choices. I stay because this is my story! I choose to walk in love with Jesus, my community, and my neighbors. We, as Hispanics,must make it a priority to continue to make our stories visible by telling stories from the inside out. Then, the timeline will accurately show the work of all of God’s people working side by side and will represent all of our stories. Sister Perez, it is very true that the absence of the hispanic Mennonite story made the presentation a very incomplete Mennonite history. And it is sad to have that blank space, because there were so many in the room who could have provided some helpful insights (not the least being Rolando Santiago, my director at the Lancaster Mennonite Historical Society). There is much to be learned from the study and embrace of hispanic Mennonites, where I personally have encountered a serious desire to live faithfully and share that faith, as well as a spirit of mutual aid and compassion. And it is quite true that the sacred task of remembering peoplehood and history takes time and preparation, so I can understand why some IMH leadership would feel they were not well enough prepared to do so publicly. You might take heart that up here in Lancaster, the Lancaster Mennonite Historical Society is making some efforts to help that story be told. We have held field trips to key sties in Lancaster County (such as Rawlinsville Mennonite Church and New Holland Mennonite Church), we have organized public meetings on the CIMH, I have written (along with Ramonita Rivera Santiago and Joanne Hess Siegrist) and history of the early hispanic-Mennonite encounters in Lancaster County, and organized a museum mini-exhibit on Latintinx in central Pennsylvania. I wish I could do more, but I lack the Spanish language skills to proceed along that line of research at this point in time. Another point to be made is that, unfortunately, the 7 ‘influential’ leaders named are all men. Elaine Sommers Rich and Katie Funk Wiebe, for example, both wrote historically and were powerfully influential in pushing the Mennonite church and its historians to include women in narratives of the past. That we continue to overlook such historians suggests what little progress has been made in new understandings of history, leadership, and influence. Marlene, it is true that there are Mennonite historians who are women: the two you’ve mentioned, Mary Sprunger, Nancy Heisey, Beth Graybill, Carolyn C. Wenger, Lois Ann Mast, Holly Scott, Joanne Hess Siegrist, H. Romaine Stauffer, Stephanie Krehbiel, Mary Emma Showalter, and yourself, and more. They are certainly contemporary (or near contemporary) noteworthy historical scholars. However, as I read the work of these historians, many of them are not doing the dance where they appear to work historically while actually working theologically in the manner that H. S. Bender most clearly demonstrated. Doris Janzen Longacre performs a similar tango in “More With Less” where she purports to give recipes, but actually delivers a hefty dose of practical theology. What I am keenly interested here is an apparent trend of combining history and theology in ways that allow for strong ecclesiastical arguments (e.g. “we wear plain dress because that is the way we have always done things,” although that is clearly not historically accurate). Nancy Heisey and Rita Halteman Finger blend theology and history to some degree, but then again their field is patristics. Stephanie Krehbiel also works historically and theologically, but much of her activist work does not rely on historical justification (though it does grapple with the past, but uses it as counter example rather then useable). It would be interesting to know if Mennonite women and Mennonite men use, or interact with, history differently but I do not have sufficient data to even begin answering that question.